The Pentacon Six that I have bought is faulty. I occasionally receive an e-mail from someone who has bought a Pentacon Six and it turns out to be faulty. I write a detailed reply every time, and have now decided that it would be helpful to publish a typical question and an answer that is typical of those that I generally write. I've got quite upset after coming back from the post office today. The brand-new looking Pentacon Six that I purchased on ebay and looks like it has left the factory just last week shows a serious shutter speed inconsistency issue, especially when set to 125th and 250th of a second. As if this wasn't enough, the shutter curtain also shows inconsistency issues on basically all speeds below 60th of a second. Sometimes it closes completely, sometimes it leaves a bit of a gap open. Now I'm facing a dilemma: I'm luckily able to send it back and get a refund but this particular copy is sooooooo beautiful, in such a mint condition I have never seen before and probably never will again. Do you think it's realistic to get it repaired for an affordable price? If yes, do you have any recommendation of a good service in Germany? I paid 199 euros for it, Biometar 80mm included. Many, many thanks in advance for the amazing and inspiring work you keep doing throughout the years. You are basically an institution for all of us lovers of analogue photography! Thank you for writing. I am glad that you have got a Pentacon Six in such excellent condition. The price also sounds very good for a working Pentacon Six! However, I am not surprised at the problem that you have discovered. It sounds as though the camera may never have been used, or only used very little, and many years ago. The NEWEST Pentacon Sixes are now 28 years old. * This is a precision mechanical instrument, and the moving parts need lubrication (oil or an equivalent synthetic product). After 28 years – especially if the camera has been hardly used or not used at all! – the original oil will have hardened. This causes the problem that you have observed. The first speed that usually reveals the problem is 1/125 sec. The camera that you have bought has been left years too long, and the lubrication problem is now affecting other speeds, perhaps all of them. 1) turning the focussing ring is hard or difficult instead of smooth. 2) if the aperture blades have oil on them, they will stick to each other and not close down properly, or even not open at all. The camera requires a routine service, in the English-speaking world sometimes called a “CLA”, which means “Clean, Lubricate and Adjust”. There are unlikely to be any other problems, and the shutter curtains are probably in good condition and so will not need replacing. To some extent you can check this yourself, by visual inspection with the lens off and the back open. With the shutter fired you will be able to examine the front and back of the second curtain, and also hold it up to a light source to make sure that there are no holes or other damage (unlikely). Advance the shutter while looking in the front of the camera, as once the mirror has come fully down you will not be able to see the front of the first curtain fully. Then examine it from the back. I would expect both shutter curtains to be in very good condition. The problems that you have encountered are not special “Pentacon Six problems”. They will apply to any mechanical camera of any brand and model after decades of non-use. If the vendor was a shop, I would suggest that you consult them about the possibility that they will get it repaired/serviced. If the vendor was a private person, I suggest that you first get some estimates of the cost of a service/repair and then ask them to give you a partial refund to cover the cost. You may wish to get an idea of the approximate date of manufacture of the camera body, from this page: http://www.pentaconsix.com/37serial.htm. The following page tells you how to find out the exact date of manufacture of the lens (via a book): http://www.pentaconsix.com/zeissdes.htm. I also recommend changing the standard focussing screen for one that is brighter. My information on screens starts on this page: http://www.pentaconsix.com/screens.htm. A new, bright, Kiev screen cut to size for the Pentacon Six is probably easy to find on eBay, or from Arax or "grizzly33bear". See this page: http://www.pentaconsix.com/kvscreen.htm. 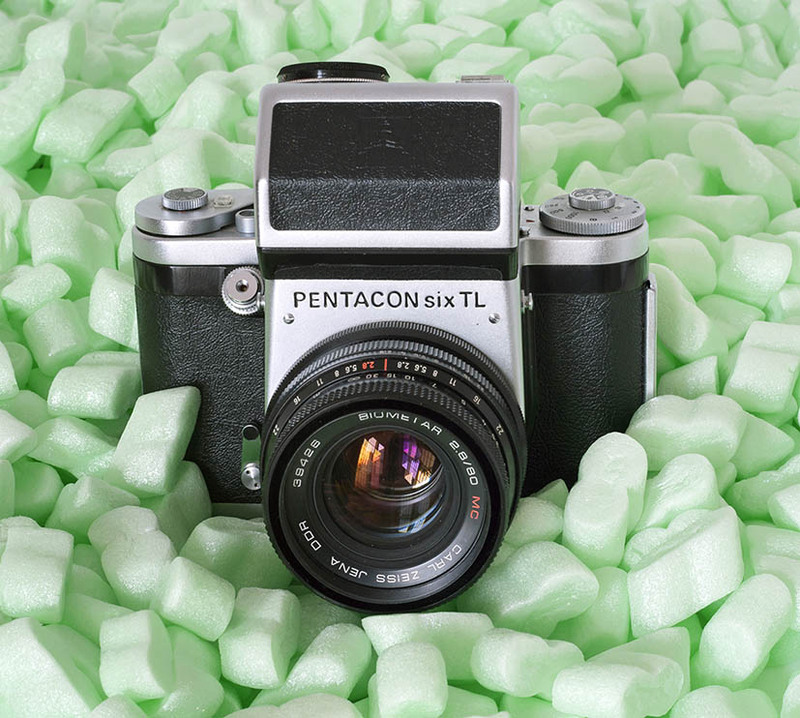 I also recommend the original Pentacon Six metering prism. Information on it is available on my instructions page: http://www.pentaconsix.com/instrs.htm (with further information elsewhere on the website). Via the page link on the instructions page you can also get to my YouTube videos on the metering prism, as well as on loading the camera and various other matters. I hope that this will be helpful to you and that you will soon be the happy and proud owner of a fully-functioning Pentacon Six! You can read about fungus problems in lenses here: http://www.pentaconsix.com/fungus.htm.